Whether you are a professional woodworker or a DIY-er looking to keep the yard ship-shape, chances are you may not have heard of a pole chainsaw. Recall those chimney brushes that can be used to sweep up cobwebs or clean dust from elevated and hard to reach places? Now imagine a saw that is designed in like fashion. You can reach tree branches that need trimming, angle it in such a way for cleaning the roof, all without having to climb a ladder or perform otherwise unneeded efforts. With the Remington RM1025SPS, power is not an issue. The design may be slender but the motor can churn out a solid 8 amps of power. Users have given it a good rating for functionality,efficiency and versatility; the pole and saw can be detached and you can use the chainsaw on its own whenever you like. Has a 10-inch reduced-kickback feature for the bar and chain. 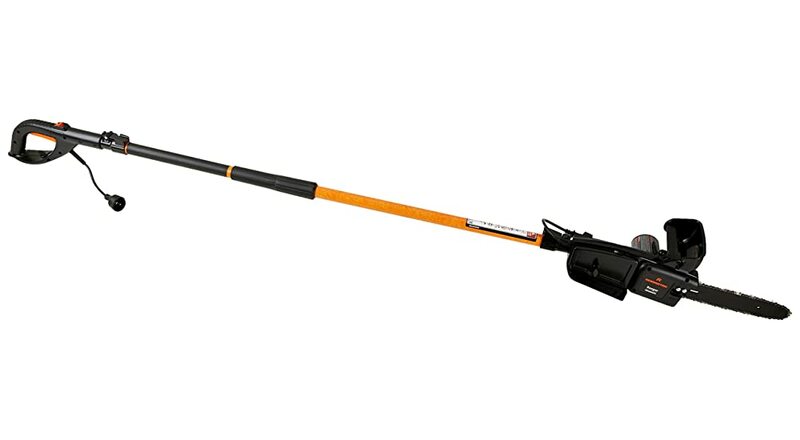 One of the few most effective 2-in-1 detachable poles on the market, the Remington RM1025SPS has much to offer. The pole is the highlight feature on this product. Made of aluminium, it is durable and sturdy especially during use. 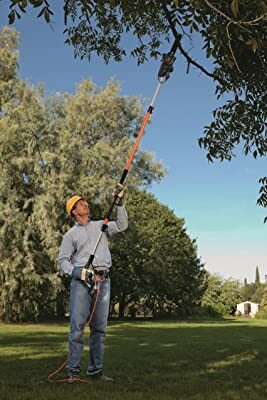 Upon adjusting it, you can gain a maximum elevation of fifteen feet (varies according to user height) and the chainsaw at the top end can cut branches at that height; ideal for tree trimming tasks. The pole’s height adjustment is quite simple and made secure by snap and lock clamps. You can trim high tree branches without pulling up a ladder. Standing and chainsawing is far more comfortable not to mention safer than angling yourself from the top of a ladder; especially on uneven terrain. The saw and pole are detachable. You can readily transform the pole saw into a bona fide chainsaw and use it like any other saw product. Few products on the market offer such versatility. To top it off, you do not need any tools to help with the detaching process. The pole stays securely locked, meaning it will not rotate around an axis. This renders tree limb cutting and trimming a cinch. Safety included, so the saw does not catch and rotate around the pole’s axis and cause you to lose your hold on it. Almost all trimming jobs can be concluded to perfection thanks to the 8-amp motor integrated into the Remington RM1025SPS. You can even cut timber with the chainsaw, minus the pole (read detachment capability earlier). Simplified operation takes the form of non-slip grips and a wonderfully lightweight design. You do not need to strain to hold the saw up at a height. Thanks to a 10-inch bar and chain kickback reduction, you will find safety and less of a kickback while working. This ensures little to no stress on your person. The singular and best use for the Remington RM1025SPS is to cut and trim trees on your property and elsewhere. Users rely on it more for height-related tasks than anything on level ground. This rather narrows down its application, but not drastically so. You might find more cons in other electric chainsaw reviews but this is all we have to say about the RM1025SPS’s downsides. 1. Reach – With increased reach (max. 15 feet) and enhanced power (8-amp motor), you can perform complex trimming tasks more simply. You do not need to rely on extra tools and ladders for the job. 2 Safety – It is advisable to wear protective gloves (industrial grade, no less) whenever you handle chainsaws, even one equipped with a pole. The Remington RM1025SPS is no exception to the rule. Your clothes too need to be tough without becoming a burden to your project. Use of safety goggles is highly recommended. After all, pole saws mean debris falling down from on high; do not want it going into your eyes. Fine dust is yet another problem. Breathing them in is far worse. Use a facemask or at least a handkerchief tied across the lower face. 3. Usage – Where maintenance is involved, this chainsaw needs little to nothing. As for height adjustment, it takes all of few seconds to make the change and get started on your trimming and cutting tasks. After the pole and attached saw are set to work cutting or trimming branches 10-15 feet above you, you can detach the pole and use the saw alone to make quick work of downed branches and limbs. Easy firewood, if that is the sort of branch, plus you get all your yard- and garden-related cleaning and cutting tasks done at no hassle. 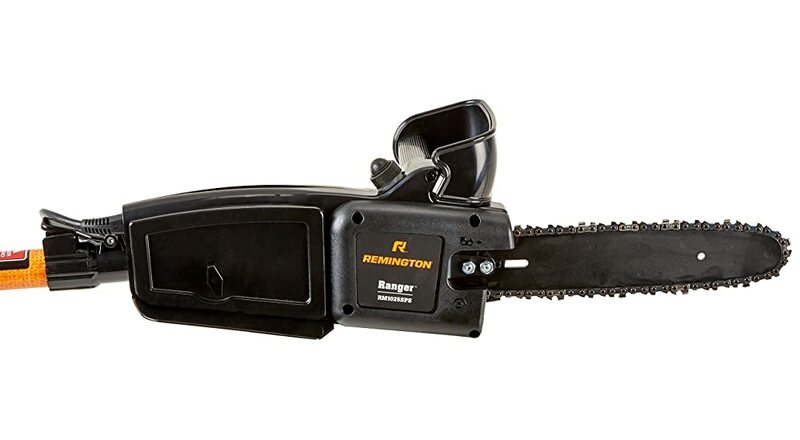 Whether you choose to have a go at it with the pole on or detach said pole and use the product much as you would a hand-held chainsaw, the Remington RM1025SPS is a professional’s dream come true; to say nothing of its benefits to a hobbyist or DIY-er. Post-storm cleanups are simplified thanks to what the Remington RM1025SPS can accomplish. Often, debris and broken branches and uprooted trees are angled into other canopies or at unseemly heights that make cleaning and cutting difficult or prolonged. With the Remington RM1025SPS, you can reach such spots and get the job done in less than half the time (for normal scenarios) compared to when a ladder and full set of tools are involved. Costing a jaw-dropping price, this affordable and effective power tool is on several people’s shopping lists. Your property will look its best after the Remington RM1025SPS is done with it. In fact, imagine the possibility of making another property beautiful, especially if you work in realty circles. Business prospects are high, and you spent very little money and effort to make a space look its best. This product is versatile, can reach extensively to perform cuts and/or trims, needs little to no maintenance, and has a safe kickback reduction feature. The Remington RM1025SPS brings options, balance, and power to your projects and tasks. We gladly recommend this electric chainsaw for light- to medium-duty cutting, cleaning, and other yard work, especially and including work that is generally out of reach. Very great post. I simply stumbled upon your blog and wished to say that I’ve really loved browsing your blog posts. As I website possessor I think the subject material here is rattling great, thanks for your efforts.